This short guide to this unconventional life offers some great insights and describes the roads less travelled in vivid detail. I have been captivated by the idea of long term world travel since I’ve read The 4-hour Workweek. 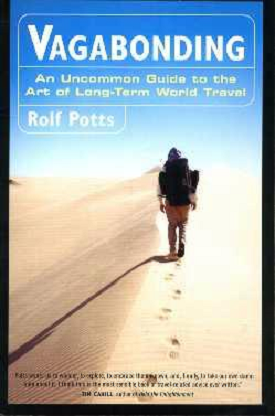 In that book Timothy Ferriss referred to Vagabonding: An Uncommon Guide to the Art of Long-term World Travel by Rolf Potts. This short guide to this unconventional life offers some great insights and describes the roads less travelled in vivid detail. Our time in Fernie was a first step in exploring long term travel, although after reading Vagabonding I’ve realised that there is so much more to do, and more importantly so much more to learn. But as Potts articulates in Vagabonding it is about getting into a completely different mind-set. But this is a mind-set very difficult to understand when you are trapped in the rat race of normal everyday life. Reading the book also got me thinking about the contrast of seeking happiness vs. significance, a topic I will try and explore in a future blog post. The last chapter in Vagabonding is about returning home and seeing it with new eyes, since you are no longer the person you were when you left. Potts talks about feeling homesick while being at home…homesick for the other places that you’ve left behind. I can appreciate that feeling right now. He also offers some advice about trying to relate the stories gathered on your travels to you friends and family back home – “leave the best parts out”. I think everybody can benefit greatly from experiencing life not as a race from weekend to weekend, but as a long extended travel experience. Where every day is something to look forward to, learning as you go, and taking in all the different parts of the world has to offer. And before you say that it won’t be possible for you, Vagabonding show how almost anybody can do it if they wish to. Whatever your excuse is, somebody else have already overcome the same challenge and made it happen. This entry was posted in Book Reviews, Lifestyle Books, Reviews on 2013/05/07 by Justinus.